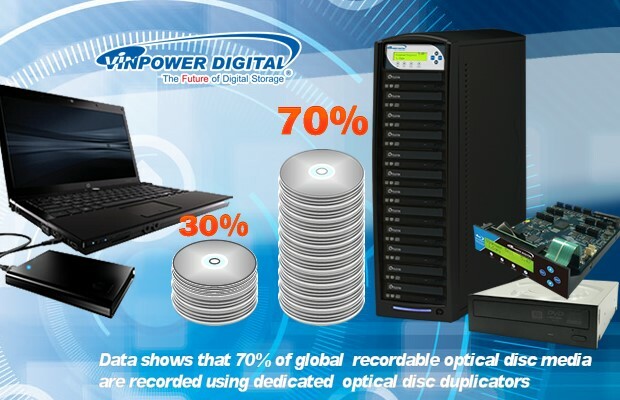 Data shows that 70% of global recordable optical disc media are recorded using dedicated optical disc duplicators. I’ve written a lot about the premature demise of the recordable optical disc. The fact that there are still billions of recordable CD, DVD, and Blu-ray discs produced and sold globally every year, shows that optical discs are not going away anytime soon. The volume may be significantly reduced from its hay day, but it’s still a sizeable volume nonetheless. With that many discs circulating around the world every year, how are those consumers utilizing the media? Given the reality that most PC’s no longer come installed with internal optical disc writer drives, how are most people utilizing this blank media that they paid hard earned money on? The answer is, approximately 70% of all recordable optical disc media are copied using an array of duplication towers and/or autoloaders. That means that duplication hardware, such as the controller, recording drives, etc., are still major factors in the handling and therefore production of recordable optical media. The whole product line is like an ecosystem, where each item is dependent on the other for purpose and a reason for being. That means that if there were no more duplication controllers, then the ability to burn the optical discs would become that much harder and would have a direct correlation to the decrease in optical disc production. That’s why Vinpower stands apart in the duplication market as we have a hand in every element within the duplication ecosystem and we work hard to make that ecosystem as available and reliable as can be. Vinpower has their own manufactured line of duplication controllers, specialty optical disc drives that are enhanced to our specifications, as well as optical disc media that offers greater compatibility and longevity that other competing products on the market.